Bob Nash will get another test as head coach when the Rainbows face Illinois on Friday. Hawaii basketball coach Bob Nash admitted to some tossing and turning Friday night following a one-point loss to San Diego in the Rainbow Warriors' season opener. The Rainbows suffered seven losses by three points or fewer last season, and started this season in heart-breaking fashion, seeing a shot at winning the game in the final seconds turn instead into a go-ahead free throw by the Toreros with 2.2 seconds left in a 73-72 loss. After watching a replay of the game later that night, reviewing the tape -- and no doubt repeatedly running various moments over in his mind -- Nash went over the footage with the team in a meeting yesterday and the 'Bows will address the issues that arose when they resume practice tomorrow. Hawaii's next test will be a stern one, as Illinois of the Big Ten visits the Stan Sheriff Center on Friday on its way to the Valley Isle for next week's EA Sports Maui Invitational. 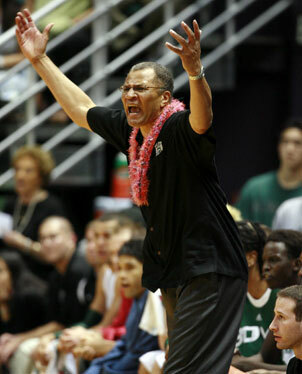 One game into the season and the Hawaii basketball team has already had a lesson in dealing with adversity. "If it doesn't kill you, it makes you stronger," was coach Bob Nash's philosophical take on the events of Friday night, when the Rainbow Warriors suffered a 73-72 season-opening loss to San Diego at the Stan Sheriff Center. The Rainbows had to make a quick adjustment to the absence of starting point guard Matt Gibson, who suffered a knee injury two days before the game, and a spirited effort came up just short when the Toreros turned a late steal into the winning free throw with 2.2 seconds left in the game. The Rainbows got together yesterday for a meeting and to review the tape of the game. They'll take today off and get back in the gym tomorrow to shore up the deficiencies reinforced by the footage and prepare for Friday's game with Illinois at the Sheriff Center. As the team looks to bounce back from the heart-breaking start to Nash's first season in charge of the program, the new coach pointed to rebounding as an area the Rainbows will have to improve on. 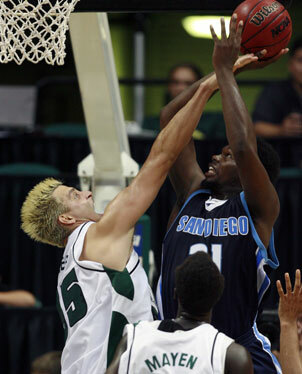 Hawaii's Jared Dillinger beat San Diego's De'jon Jackson to the basket Friday night. Dillinger finished with 14 points. The Rainbows had 18 offensive boards and scored 16 points off of those, but San Diego outrebounded the Rainbows 44-40 and Nash was more concerned with the Toreros' 18 offensive rebounds and 14 second-chance points. "The main thing is we gave up too many second-chance baskets without blocking out," Nash said yesterday, "and we took too long to get into our offensive sets and couldn't get into any rhythm." Gibson's absence contributed to the staccato pace of the Rainbows' halfcourt offense early in the game. Gibson suffered a sprained medial collateral ligament in his knee during Wednesday's practice and sat out the game. He's questionable for Friday's game. The Rainbows ran a point guard by committee, with Bobby Nash (who led the Rainbows with a career-high 22 points and nine rebounds), Kareem Nitoto and Jared Dillinger filling those duties at various points. Stephen Verwers went for the block against San Diego's Gyno Pomare. As the UH offense struggled to get into a flow, the Rainbows fell behind by as many as 14 in a first half in which they shot 33 percent from the floor. They battled back to take their first lead at 72-70 with 44 seconds left, but the Toreros promptly tied the game and Gyno Pomare poked the ball away from Stephen Verwers on UH's final possession and made one of two free throws with 2.2 seconds left. "We could have done better. We fought hard to give ourselves a chance to win and they showed a lot of character," said Nash, who conceded to having a fitful night of sleep as he contemplated the what-ifs. "There's a lot of things we could have done better, but we'll learn from it and continue to make progress. ... We have a bitter taste in our mouths because we know we can play better." Nash was encouraged by the play of newcomers Bill Amis and Nitoto in their Division I debuts. Amis started the game at power forward and contributed six points and six rebounds in 20 minutes. Nitoto saw more playing time than initially planned due to Gibson's injury and struggled offensively, going 1-for-10 from the field. But Nash was pleased with his effort on the defensive end of the court. But the outcome still gnawed at the Rainbows. "We don't want to make a habit of losing at home," Nash said. "That's just not acceptable." Along with Bobby Nash matching his career high in scoring, Dillinger's 14 points and Verwers' 11 were also career bests for the seniors. ... The Rainbows will meet San Diego again on Dec. 2 at the Jenny Craig Pavilion in the back end of their home-and-home series. ... Friday's UH-Illinois game is scheduled to start at 8:05 p.m.